The Times Square in Manhattan New York is known as “the crossroads of the world” due to its location in bustling commercial center and high reputation. The NASDAQ LED screen is one of its famous landmarks, and this half-cylindrical screen is also known as “the world’s number 1 screen”. On April 2 and 3, 2018, HAND got on this large screen with a mission to be “the bridge connecting enterprise management and information technology, and help enterprises to realize digital transformation rapidly “. Brand exposure asides, it is also showing HAND’s determination to go global with Chinese enterprises. HAND Enterprise building National Brand for the new information era! In 2016, China Central Television officially launched “the national brand cultivation plan”. This plan is aimed to find, discover and shape a batch of “new national brands” to represent China and compete in the world economic stage for the next 30 years. This plan also hopes to cultivate trustworthy “craftsman” brands, for domestic brand advocacy and speak out to the world. 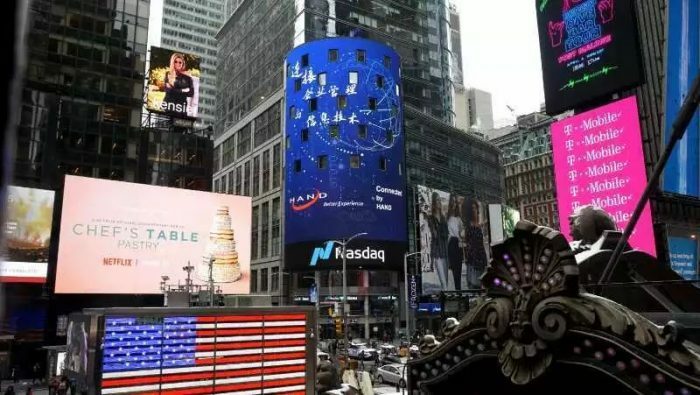 Under this background, HAND being the information technology industry partners of the “Chinese Brand Innovation and Development Project” participates in the conversation by launching on the NASDAQ screen. It aims to build a trustworthy national brand for Chinese enterprises. HAND, headquartered in Shanghai , started its business from China home market, and the company have set up branches or technical service centers in Beijing, Guangzhou, Wuhan, Xi ‘an and Chengdu. Over the years, HAND’s services have been radiating, and its service scope nearly covers all fields of the enterprise management informationisation, and provide enterprises with complete planning, consulting, implementation, custom development, operations and other services, forming a very recognizable service ability. In the field of new technologies, HAND is also standing in the forefront of IT technology innovation and management practice innovation. HAND has accumulated rich technical reserves in hot fields such as cloud computing, big data, Internet of things, artificial intelligence. In the ever-changing and variable consulting industry, what HAND always pursues is growth with the customers. As a result, the company has gained the trust of many enterprises. The trust of customers has brought long-term cooperative relationship with HAND, which is also an important reason for the survival and sustained rapid development of HAND in the past 20 years. HAND people has been sharing a common vision, i.e. hoping HAND could become a top international enterprise informatisation / digitalisation service provider that is comparable to first class consulting companies, and highly trusted and preferred partner of outstanding enterprises in the aspect of informationisation / digitisation. To realize this vision, HAND will not only continue to improve and breakthrough in the aspect of service quality, human resource development, research and development innovation, but also hope to be able to become an important force to enhance national competitiveness in the field of China digitalisation. Attaching great importance to the development of overseas markets, HAND has set up subsidiaries in the United States/Japan/Singapore, and built a professional team focusing on overseas business. HAND has over ten years of experience in overseas promotion implementation, and can cover all aspects of the service such as basic operation of the subsidiary or branch enterprise, IT integration after merger and acquisition of local enterprises, and global IT operation and maintenance, and provide end-to-end IT support for Chinese enterprises going abroad. 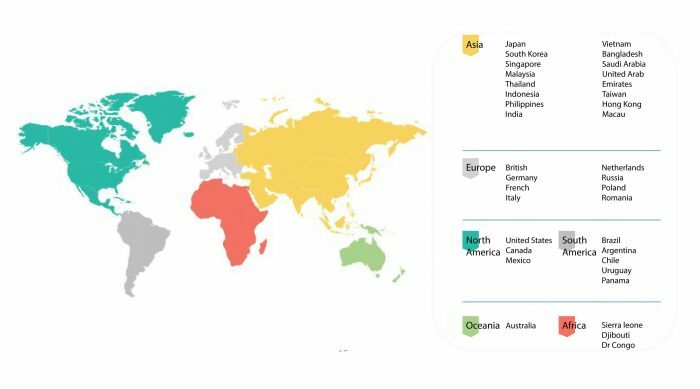 As of 2017, HAND’s footprint has covered 65 countries or regions in six continents (Asia, Europe, North America, South America, Oceania and Africa). HAND is one of the largest ORACLE/SAP implementation service providers in China, or even in Asia, who has helped numerous European and U.S. enterprises with IT promotion and construction in China. HAND has established good partner relations with other local IT provider such as Tencent / Alibaba / Huawei. It can provide more value-added services and help overseas companies expand their business in China. With the deepening of the globalization layout, in addition to serving overseas enterprises, what HAND has done is to help more Chinese enterprises go global, and take root in overseas with more powerful consulting and implementation ability. In the era of new information, China’s power is rising gradually, and HAND has gradually accumulated more competitive power than imagined in the business of globalization. For IT integration problems faced by Chinese enterprises after overseas mergers and acquisitions, HAND have gain fully successful experience in this field, and the company can consider comprehensively in various aspects such as enterprise merger and acquisition strategy, organizational structure and business processes, resource allocation, IT strategy and policy, IT level difference of two parties, and provide enterprises with IT integration optimization scheme that match their strategies, and help enterprises to achieve steady and rapid overseas development and depth layout, and make Chinese national brand stronger and influential. Times Square is a landmark of New York. HAND’s getting on the “Crossroads of the world”, not only shows its courage to focus on the international layout, but also the determination and strength to help Chinese enterprises go global. This further put HAND’s vision of “hoping to become a top international enterprise informatisation / digitalisation service provider that is comparable to first class consulting companies” within grasps. The Chinese power under the new information age is not to be underestimated!